Glen Innes Showground Trustees John Lynn, left, Col Price, Northern Tablelands MP Adam Marshall and Patric Millar discussing the funding win for the showground. 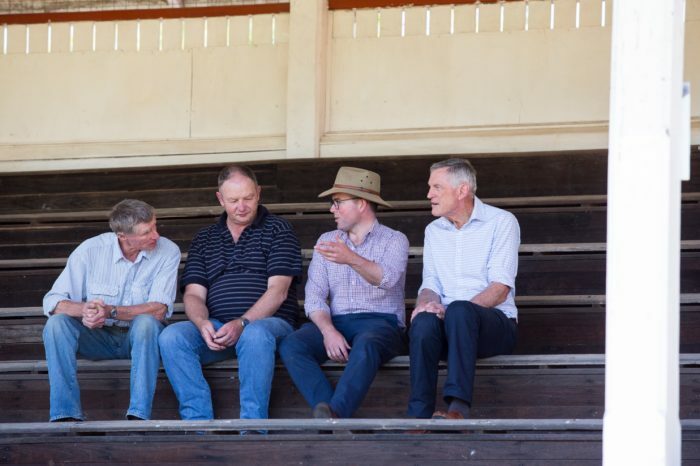 NORTHERN Tablelands MP Adam Marshall has today announced a $30,000 State Government funding drop that will flush out the old to create a new toilet block at the picturesque Glen Innes Showground. Mr Marshall said the Glen Innes Showground Trust and had wasted no time in getting rid of the old facilities, already engaging a local builder to construct the new ablutions block. Showground Trust member Michael Condon described the funding win from the 2018 NSW Community Building Partnership Fund as fantastic news – and said they’d already got stuck into the work to see the new block come on line. “We have destroyed the old, dirty unsafe ablutions block and we’re ready to replace it with a new modern block,” Mr Condon said. Mr Marshall said the old block had probably been there for over 50 years and was way beyond its useful life. “But this new block will do the job it needs to do; it’s adjacent to the shearing shed, where the show society hosted the Australian Shearing Championships, and where campdrafters camp, and where a lot of Guild people camp when the Glen Innes show is on,” Mr Marshall said. Mr Condon said the new block was the only one on the northern end of the showground and would complement the six other blocks on the site. “We’ve got a bit of a traditional design but there’s going to be a female and a male shower, double toilet facilities in each and with basins, but with tiles and modern amenities,” Mr Condon said. Mr Marshall said the new amenities should be in place for the annual Glen Innes Show, starting 18 February 2019, often referred to as the “Royal of the North”, which last year celebrated its 150th show. “The Glen Innes is a reflection of the strong Glen community,” Mr Marshall said. “There’s about 100 volunteers who make up the Glen Innes Agricultural Show committee; it’s a massive committee, and when many communities are struggling to find people to be on show committees, to keep our country shows alive, the Glen society is vibrant and energetic and is bucking that trend.